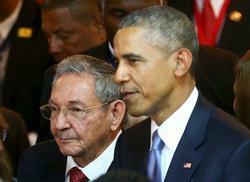 Equipo Nizkor - Obama, Castro hold historic meeting, agree to foster 'a new relationship'. President Obama and President Raúl Castro symbolically ended more than a half-century of official estrangement between the United States and Cuba here Saturday in a historic-face-to-face meeting that Obama said put them on "a path toward the future." In a small room with two chairs side by side, Castro smiled as Obama said that they would relay their concerns about each other's policies but could disagree with a spirit of respect. "Over time, it is possible for us to turn the page and develop a new relationship between our two countries," Obama said. He said their immediate task is to reopen embassies in Havana and Washington. After the two shook hands, Castro, speaking in Spanish, said he agreed with everything Obama had said. "We are willing to discuss everything, but we need to be patient, very patient," Castro said before reporters were ushered from the room. "We might disagree on something today on which we could agree tomorrow." In a later news conference, Obama said that he was "optimistic that we'll continue to make progress, and that this can indeed be a turning point." The meeting, on the sidelines of the 35-nation Summit of the Americas being held here, lasted roughly an hour, and the two leaders did not set a date for the reestablishment of diplomatic relations or the reopening of embassies in their respective capitals. In a sign of the difficulty for the two countries in making basic, concrete progress toward overcoming their long-standing enmity, Cuba's foreign minister, Bruno Rodríguez, said the two countries would meet again for talks "as soon as possible" but were still working to achieve the "appropriate context" for formal ties. Calling his talk with Castro "candid and fruitful," Obama said that "I can tell you that in the conversations I've had so far with him -- two on the phone and most recently face to face -- we are able to speak honestly about our differences. .?.?. We have very different views on how society should be organized," he said, and the United States was "not going to stop talking about human rights, free expression and freedom of the press." Obama's welcome of Cuba here ended a long-standing irritant with Latin America, most of which mended fences with Cuba decades ago, and added a potential legacy issue to his presidency alongside a nuclear deal with Iran, assuming he is able to achieve it. Throughout his four-day swing through the region, which began Wednesday with a stop in Jamaica, Obama has been upbeat and perhaps relieved to deal with regional relations that, even including Cuba, are far less fraught than the constant drumbeat of death and destruction in the Middle East, and sparring with Russia over Ukraine. While there are opponents to his Cuba outreach in Congress, they are not nearly as numerous, or as dangerous, as those in both parties who have questioned aspects of his foreign policy. Reflecting the other problems he faces, Obama said that "Cuba is not a threat to the United States. It doesn't mean we don't have differences, but on the list of threats that I'm concerned about, I think it's fair to say that between [the Islamic State], Iran getting a nuclear weapon, activities in Yemen and Libya ..... Russian aggression in Ukraine ..... I could go down a pretty long list. Climate change. I could go down a pretty long list." Despite Castro's offer to discuss "any issue," the Cuban leader also told Obama that his government would not accept U.S. efforts to "bring about changes in the political and economic system in our country," according to Rodríguez. Their meeting followed a dramatic speech to the gathering in which Castro called Obama "an honest man . . . a humble man," who is not to blame for what he said was more than a century of U.S. oppression of Cuba and who is "courageously" trying to persuade Congress to lift its embargo against his country. Speaking for nearly an hour, Castro first pounded the table and recounted the history of what he called U.S. oppression and abuse of Cuba, from early military incursions and occupation to the Bay of Pigs invasion and what he described as U.S.-sponsored terrorist attacks on the island. "I apologize to Obama for expressing myself so emotionally," Castro said. "President Obama has no responsibility for this. There were 10 presidents before him; all have a debt to us, but not President Obama. .?.?. I have read his books -- parts of them -- and I admire his life." As he spoke, Obama sat without expression, his eyes downcast. The two leaders announced in December that they would normalize relations and that they intend to reestablish formal diplomatic ties. The opening of embassies in Washington and Havana has awaited the U.S. removal of Cuba from its list of state sponsors of terrorism . Obama, at his news conference, said that the recommendation to remove Cuba from the list, which Havana has said must precede opening embassies, is now on his desk. "I've been on the road," he said. "I want to make sure I have a chance to read it and study it before we announce it publicly." White House officials said the announcement would be made "in the coming days." "The concerns around the embassy are going to be mostly on the Cuban side," Obama said. "They haven't dealt with an American Embassy in Cuba for quite some time." U.S. negotiators have said Cuba must agree to give U.S. diplomats freedom to travel around the island and allow Cuban citizens free access to the embassy. Before the highly anticipated bilateral meeting, each of the 35 hemispheric leaders at the summit first delivered formal speeches in the public plenary session. Obama, in what appeared to be extemporaneous remarks that were not part of his prepared speech, addressed Correa by name, saying he was "not interested in theoretical arguments." The Cold War, he said, "has been over for a long time, and I'm not interested in having battles that, frankly, started before I was born. What I'm interested in is solving problems and working with you .?.?. in the spirit of alliance." "I always enjoy the history lessons that I receive when I am here," Obama said evenly. "I'm the first to admit .?.?. there are dark chapters in our history. .?.?. We can, I suppose, spend a lot of time talking about past grievances. And I suppose that it's possible to use the United States as an excuse .?.?. for political problems that may be occurring domestically" in Latin America. "But that's not going to bring progress." Debates about the past, Obama said, in a clear jab at Correa's economic and political difficulties at home, are "not going to solve the problems of children who can't read, who don't have enough to eat. .?.?. I just want to make very clear that when the United States speaks out on human rights, it's not because we think we're perfect, but because we think the idea of not killing people because they disagree with us is the ideal."